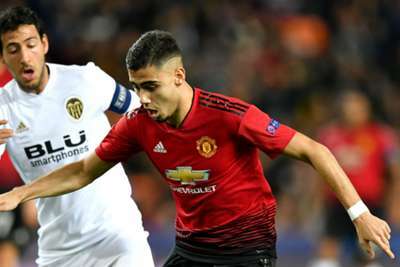 Andreas Pereira has pleaded for more opportunities at Manchester United, convinced he would "get better and better" with regular playing time. Brazil international Pereira came through the ranks at United and was highly rated while learning his craft in the club's younger teams. Successive loans to Granada and Valencia in LaLiga suggested he was ready for more first-team football and he started United's opening two games of this season. Against Leicester City in a 2-1 win, Pereira caught the eye in midfield, keeping his place in the side for the trip to Brighton and Hove Albion, but United lost 3-2 and the 22-year-old – who has hooked at half-time – has not been seen in a Premier League starting XI since. He did feature from the start against former club Valencia on Wednesday, and although he made little impact in the 2-1 defeat, he is adamant a run of games will allow him to progress. "I'm hungry for more," he told MUTV. "I'm trying to do my best, to keep being involved in and out, each and every week. "It was good for me to be involved, to get some minutes. It was difficult at the start because of the match rhythm, but I did my best. It was, unluckily, not our night. Pereira's contract runs out at the end of the season and there have been reports suggesting United have no intention of offering him an extension, meaning this is likely to be his final crack at the Champions League with the Red Devils. Wednesday's defeat meant they were consigned to second place in the group and will likely end up with a tougher draw in the last 16, something Pereira is irritated about, particularly as a win would have seen them pip Juventus due to their shock Young Boys loss. "It is a little bit frustrating," Pereira added. "We wanted to be first, so it's a pity that we didn't finish first. "It's good for us [to qualify]. We're now looking forward to the next stages of the Champions League and we will do everything to go past it. "Yes, we'll have to face a big club, but don't forget that we are a big club as well, so we are going to face it and we are going to do our best to try to win it."